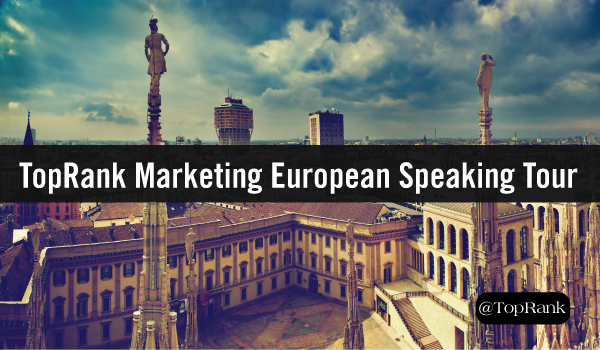 TopRank Marketing CEO Lee Odden is returning to his globetrotting ways this fall, heading to three European cities to share his insights on content and influencer marketing. Lee will begin his European tour at Digital 2016 in Riga, Latvia, followed by speaking pit stops at the SMXL Milan 2016 in Italy and Congress Content Marketing & Web Editing Conference in Utrecht, The Netherlands. Below we dive into the details of each conference and what attendees will see and learn from Lee’s presentations. Conference Details: Billed as the biggest social media and digital marketing conference in the Baltics, Digital 2016 features several industry expert speakers from around the region, as well as the United Kingdom and the United States. On Day 2 of the conference, Lee will lead a workshop session focused on the power of influencer content. One of the most popular trends in marketing is content marketing, but many companies are challenged to create a variety of engaging content on a consistent basis. In this presentation, Lee will provide a framework for digital marketers to scale quality content creation by partnering with internal and external influencers. Get more information about the event or register. Conference Details: This “Extra Large” event features three days of keynotes, presentations, track sessions, training workshops and networking opportunities with gorgeous Milan serving as the backdrop. Lee’s will deliver a presentation focusing on the role content plays in helping brands become the best answer for their audience. With billions of internet connected devices, today’s customers can find information just about anywhere, anytime, driving more companies to invest in content marketing. The problem is, consumers are overloaded with information and increasingly numb to brand content. Through best practices and examples, Lee’s presentation will illustrate role of content marketing integrated with search, social and influence, so that brands can become the best answer for their customers, without spending the biggest budget. Conference Details: This one-day event is jam packed with inspiring speakers and helpful workshops aimed at both new and seasoned marketing professionals. Lee will deliver a keynote address on content and influence integration. Other keynote speakers include Ed Peelen and Tony Bosma. In this keynote presentation, Lee will provide four essential steps for an integrated approach to content that is co-created with influencers, optimized, socialized and publicized in a way that makes brand content more relevant, credible, easy to find and actionable. Unable to Attend These Awesome Events? No worries. Follow the action on Twitter. Discover more digital marketing and social media events happening this fall.